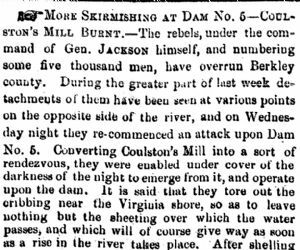 The rebels, under the command of Gen. JACKSON himself, and numbering some five thousand men, have overrun Berkley county. During the greater part of last week detachments of them have been seen at various points on the opposite side of the river, and on Wednesday night they re-commenced an attack upon Dam No. 5. Converting Coulstons Mill into a sort of rendezvous, they were enabled under cover of the darkness of the night to emerge from it, and operate upon the dawn. It is said that they tore out the cribbing near the Virginia shore, so as to leave nothing but the sheeting over which the water passes and which will of course give way as soon as a rise in the river takes place. After shelling the rebels out of the mill, on Thursday evening a party of the Connecticut 5th Regiment, and some of the men of Lieut. Rickett's battery, went over the river in a skiff and burnt the mill, which was a very large and costly one, the light of the conflagration being distinctly seen from this town.— It was a stronghold of the rebels and military necessity required its destruction, but it may be made the basis of an excuse for the destruction of more property on this side. An interchange of shots and shells between the batteries on both shores was kept up in the vicinity of the Dam for several days, putting in great peril the lives and property on both sides, but especially on this. Some three shells passed through the barn of a Mr. PERRALL, ripping the timbers pretty badly, but fortunately none of them exploded, although one fell upon the mow of the barn and hurried itself in the hay. A large conical shell passed between the house and barn of our old friend DENTON JACQUES, Esq., and exploded some distance off. Mr. Jacques' house is within easy range of the rebel guns, and is liable to be destroyed at any moment. Our report from the other side is to the effect, that JACKSON, the rebel General, swore he would not leave the dam until it was entirely destroyed, and another is, that he had been peremptorily ordered back to Winchester by a messenger from head-quarters.